Draft: 2008, Minnesota Twins, 4th rd. Daniel Ortiz… Married Tiffany Cochran Garcia (2/20/14); has one daughter, Daniella (9/25/14)… Is a 2008 graduate of Benjamin Harrison High School (PR)…Hobbies: Having fun with his family, watching Netflix and taking his daughter to Chuck E. Cheese's…Signed by: Hector Otero. Spent majority of the season with Indianapolis (AAA), playing all three outfield positions... Recorded 27 multi-hit games, including three 4-hit games...Had his contract selected by PIT on 4/29, and made his ML debut that night at MIA...Collected his first ML hit, 5/18 vs WSH... Appeared in 9 games for PIT before being optioned back to Indianapolis, 5/25...Batted .321 (18-56) in 15 games during May for Indianapolis... Had a 13-game hitting streak, 8/16-29...Played for Aragua in Venezuelan Winter League. April 3, 2019 Pericos de Puebla signed free agent OF Danny Ortiz. January 28, 2019 OF Danny Ortiz assigned to Puerto Rico. November 14, 2018 OF Danny Ortiz assigned to Indios de Mayaguez. November 2, 2018 LF Danny Ortiz elected free agency. July 31, 2018 Lehigh Valley IronPigs activated LF Danny Ortiz from the 7-day disabled list. July 24, 2018 Lehigh Valley IronPigs placed LF Danny Ortiz on the 7-day disabled list retroactive to July 21, 2018. Right thigh contusion. 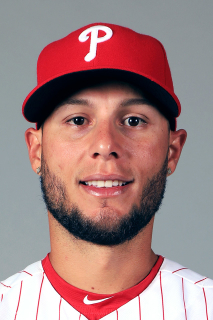 January 5, 2018 OF Danny Ortiz assigned to Indios de Mayaguez. January 3, 2018 Philadelphia Phillies signed free agent OF Danny Ortiz to a minor league contract and invited him to spring training. January 3, 2018 LF Danny Ortiz assigned to Lehigh Valley IronPigs. November 27, 2017 OF Danny Ortiz assigned to Tigres de Aragua. November 6, 2017 CF Danny Ortiz elected free agency. October 23, 2017 OF Danny Ortiz assigned to Aguilas Cibaenas. August 7, 2017 Pittsburgh Pirates sent CF Danny Ortiz outright to Indianapolis Indians. August 5, 2017 Pittsburgh Pirates designated OF Danny Ortiz for assignment. May 25, 2017 Pittsburgh Pirates optioned OF Danny Ortiz to Indianapolis Indians. May 17, 2017 Pittsburgh Pirates recalled Danny Ortiz from Indianapolis Indians. April 30, 2017 Pittsburgh Pirates optioned OF Danny Ortiz to Indianapolis Indians. April 29, 2017 Danny Ortiz assigned to Pittsburgh Pirates from Indianapolis Indians. April 5, 2017 OF Danny Ortiz assigned to Indianapolis Indians. January 14, 2017 OF Danny Ortiz assigned to Cangrejeros de Santurce. January 12, 2017 Danny Ortiz assigned to Cangrejeros de Santurce from Indios de Mayaguez. January 9, 2017 Pittsburgh Pirates signed free agent OF Danny Ortiz to a minor league contract and invited him to spring training. November 7, 2016 CF Danny Ortiz elected free agency. January 30, 2016 OF Danny Ortiz assigned to Puerto Rico. November 29, 2015 CF Danny Ortiz assigned to Indianapolis Indians. November 20, 2015 Pittsburgh Pirates signed free agent LF Danny Ortiz to a minor league contract and invited him to spring training. November 6, 2015 LF Danny Ortiz elected free agency. October 29, 2015 OF Danny Ortiz assigned to Indios de Mayaguez. October 29, 2015 Indios de Mayaguez activated OF Danny Ortiz. February 2, 2015 OF Daniel Ortiz assigned to Puerto Rico. December 19, 2014 Minnesota Twins invited non-roster LF Danny Ortiz to spring training. October 29, 2014 OF Daniel Ortiz assigned to Indios de Mayaguez. June 3, 2014 LF Danny Ortiz assigned to Rochester Red Wings from New Britain Rock Cats. March 14, 2014 OF Daniel Ortiz assigned to Minnesota Twins. January 29, 2014 OF Daniel Ortiz assigned to Puerto Rico. October 31, 2013 OF Daniel Ortiz assigned to Indios de Mayaguez. April 3, 2013 OF Daniel Ortiz assigned to New Britain Rock Cats from Fort Myers Miracle. March 7, 2013 OF Daniel Ortiz assigned to Minnesota Twins. January 31, 2013 OF Daniel Ortiz assigned to Puerto Rico. April 30, 2012 Daniel Ortiz assigned to Fort Myers Miracle from Beloit Snappers. April 4, 2011 Daniel Ortiz assigned to Beloit Snappers from Elizabethton Twins. October 22, 2010 OF Daniel Ortiz assigned to Indios de Mayaguez. June 22, 2010 Daniel Ortiz assigned to Elizabethton Twins from GCL Twins. June 15, 2010 RF Daniel Ortiz roster status changed by GCL Twins. November 11, 2009 OF Daniel Ortiz assigned to Criollos de Caguas. September 25, 2009 GCL Twins activated RF Daniel Ortiz from the 60-day disabled list. June 23, 2009 GCL Twins placed RF Daniel Ortiz on the reserve list. June 11, 2008 Minnesota Twins signed RF Danny Ortiz.